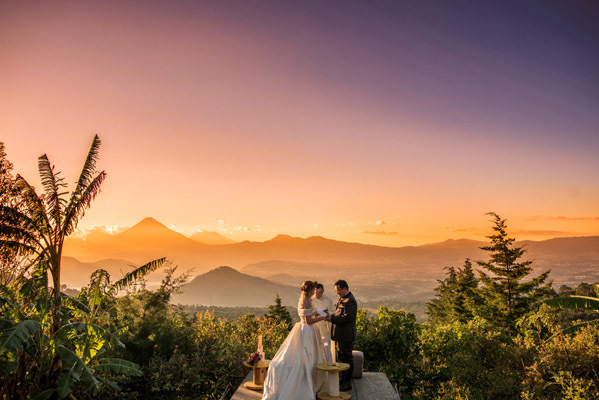 The breathtaking scenery at this natural preserve in Guatemala makes this wedding ceremony even more romantic. A water-lined aisle, gorgeous backdrop, and flower-draped structure make this ceremony picture perfect. Talk about romance — this bride was swept off her feet after her ceremony inside a palace in Portugal. At the end of this couple's first dance, fireworks lit up the night sky. This couple dreamed of dancing under the stars at their destination wedding in Mexico. Their wedding planner took it to the next level by hanging tin stars (the symbol of San Miguel, where the wedding took place) and twinkling lights above the dance floor. This couple embraced natural elements for their wedding under the Tuscan sun. In Persian weddings, the "Sofreh Aghd" is an important piece of the ceremony décor — it's where the legal marriage and ceremonial traditions are exchanged. This couple's display is a work of art. Guests dined al fresco at an open air church decorated with fairy lights. Scottish traditions shined throughout this couple's romantic wedding in Italy — we love how this photo subtly put the emphasis on the groom's kilt. Is there anything more dreamy than walking hand-in-hand with your beloved through the Italian countryside? Set on a cliff overlooking the ocean, this clear tent illuminated with twinkling lights was a winning combo. It's all in the details — we love that this menu card was propped up by a fork. A personal touch — the couple's initials were carved into this naked wedding cake. Lanterns and cafe lights perfectly illuminated the dance floor at this outdoor wedding. Vintage romance in Italy — this couple's convertible getaway car is a fun choice. See the rest of the award-winning photos here.